Every day, it seems, there are signs of the Democrats’ increasing desperation. They obviously don’t like what they see in the polls and are worried about November. But what to do about it? It would be hard to ratchet up their customary hysteria much higher, so they are reaching deeper into their bag of tricks. 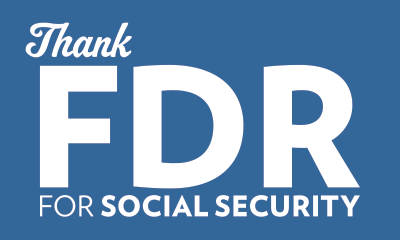 Thank FDR for Social Security! Of course, Roosevelt won’t be on the ballot. And is Social Security somehow an issue in this year’s election? Not that I’ve noticed. So this appears to be mostly a nostalgia play: forget about Obamacare, the stimulus, lousy economic growth, $17 trillion in debt, Libya, Syria and Ukraine, and recall the glory days! Not long ago the Democrats were yearning for the 1950s. Now it’s the 1930s. They keep regressing; what’s next? Maybe the party will relive its pro-slavery roots before long. They aren’t that hard up yet, but I have a feeling that Democrat Desperation will become a continuing series.